This is one of those films that you feel the producers and everyone else involved had high hopes for - that is, it looks as if it was given extra special care and NOT treated like a run-of-the-mill, quickie, low budget film - but it apparently didn't quite make the grade. That's not to say this isn't a good movie. As a matter of fact, it's a slight cut above a lot of what has survived from the silent era. And there's not just one reason why it's good - there are several. One (and this doesn't get mentioned often) is the name of Stephen Goosson. Goosson was an art director - and a good one - and his name will pop up rather frequently on silent films. Two of his most well known are "Oliver Twist" (1922) and "The Sea Hawk" (1924). However, his work during the sound era is even more impressive, and he appears to have been a favorite of Frank Capra working on such films as "It Happened One Night" (1934), "Mr. Deeds Goes to Town" (1936), "Lost Horizon" (1937) and "Meet John Doe" (1941). The scenes on the skyscraper are impressive. The viewer is constantly aware of the fact that the men are working at great heights. The skyline in the distance or the street below are well-done and add to the sense of "eerieness" that the viewer gets, especially when the hijinks of Blondy (William Boyd) and Swede (Alan Hale) make for some close calls. That "eerieness" hits the viewer full in the face when the Red (Wesley Barry) falls to his death after copying Blondy's rope-swinging antics from one section of the skyscraper to another. This set is well done and shows an "L" shaped corner of the building with a slight side view of the street far, far below to keep us reminded of he height. Red swings from a girder on one wall, across open space, to a girder on another wall. It all looks very real, which makes it even more of a "shock" when he loses his balance and falls to his death. 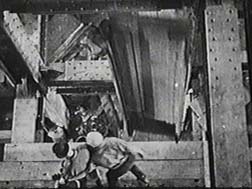 Gooson's best work is in the scene where Blondy is sitting on a girder on the side of the building, one leg hanging down (the two men are constantly oblivious to the dangers of their working conditions). From this vantage point, he can look down a couple of floors lower to the roof of the building next door. There is the chorus line rehearsing for a musical revue and Sally (Sue Carol) is one of them. To get over to her, Blondy instructs the crane operator to shift him as he stands with one foot in the large hook they use to lift the beams into place. The sense of danger and height is there, and the sets are very realistic, not stagy. The direction is also somewhat "ambitious" (the film is directed by Howard Higgin who also directed "Smouldering Fires"). One appealing device is the use of the steam "whistle" to take us from one segment of the story to another. Its most effective use follows the scene where the girder falls, crashes through the platform on which Blondy and Swede are standing and sends them plummeting downward. The scene switches to a close up of the whistle blowing, and we're not sure if it's signaling the end of the workday or the end of a life. A little different "look" is also attempted with the camera angles. For example, several shots of the two men are from above, as if we are looking down from a higher level of the skyscraper (such as when the falling girder crashes through the platform on which Blondy and Swede are standing). This effectively keeps us reminded of exactly where these men are. In contrast, there are a couple of scenes when we are shown only the feet or legs of a character. The first instance is when Sally is introduced to us. After several minutes of nothing but these two "tough guys" and their roughhousing, we get a pleasing view of a pair of legs in high heels taking a lively stroll down the city street. When she stops to look at a sign advertising "Help Wanted," the camera slowly moves upward until we see our heroine. The most effective use of this device is at the end of the movie. Swede and Sally are sitting on a girder on the skyscraper late one evening on their "date" when all of a sudden, they look down to the floor below and see a pair of legs hobbling along on crutches. We can't see above the legs for quite some time because the next girder in front of them blocks the view. The focus is on Blondy's crippled legs, and, therefore, his helplessness, and we are moved by his courage. However, not only is the "look" of "Skyscraper" better than average, so's the storyline. It has plenty of comedy, and the horseplay and verbal sparring of the two rough and tumble construction workers is funny stuff. However, the "meat" of the story comes with Blondy's inability to deal with his injuries. At first, Red's death early in the movie seems somewhat out of place, especially in the midst of the comedic horseplay of the two men. However, it establishes early on in the film the dangers of their work and that we are watching a depiction of real life where bad things can happen. Also, we are enjoying it so much, we don't really realize that the "manly" shenanigans of the two men aren't just for comedic effect - this is well-planned character development. This he-man, tough guy persona is important to these two guys. That's who they are and what they're all about. When Blondy's injury came along, in his mind it took away his manhood. He couldn't perform the "man's work" he had been doing on the skyscraper. He couldn't be the "tough guy" anymore. And this attitude affects all those around him - most importantly, Sally. When she returns from a long road trip with the musical revue, the first thing she does is look up Blondy. She doesn't know about his injury, and he certainly doesn't want her to know. As a matter of fact, while hiding his injury, he is rude and abrupt with her and lies about having another date when she asks him to come to the show. Sally leaves in tears. He can't bring himself to have a relationship as long as he is a "cripple." There have been movies using this same theme many times over the years (How many movies have been made about a successful athlete whose career comes to an end because of some freak accident?) However, this is a somewhat unusual theme for 1928. "Skyscraper" almost takes on some aspects of a psychological drama. But, the film doesn't get mired down in this tragedy, the psychological workings of the injured man's mind or the resulting sadness from broken relationships. There's more for the viewer than that. The comedy has already been mentioned, but what makes the comedy enjoyable is the satisfying development of two characters - Blondy and Swede. They are roommates, they have a deep affection for each other (though neither would admit it - that wouldn't be "manly"), and they constantly battle with one another. One reason for many of the confrontations that take place is the pranks they pull. For example, Blondy manages to get Swede's rear-end torched. Swede drops a hot rivet in Blondy's back pocket. Blondy wins all of Swede's money in a crap game with trick dice. The titles, with the two men's syntactical slaughter, add some verve to the story, too. For example, Swede confesses to picking Blondy's pocket and says, "If I ain't greatly mistook, my good man, this here wallet is your'n." Blondy condescends to Swede later, "Lissen, Unconscious, if I woulda wanted to, I coulda been your boss - but I ain't never had no time." The affection they hold for each other is evident, too, in spite of the constant fighting, but neither would dare admit such concern for his partner. This "affection" plays a major role in the story, too, as Swede tries to deal with Blondy's self-pity over his injury and resistance to rehabilitate himself. When Blondy says he's satisfied to work in the tool shed (which is where he's placed after his injury), Swede calls him a "liar" and a "yellow bum." Swede then walks angrily out of the tool shed, but, once outside, the pain on his face if evident over the tough stance he has to take with his friend. 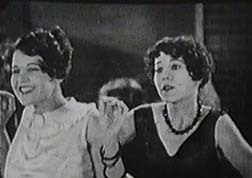 After Swede learns of Blondy's rude treatment of Sally when she came to visit, he gets an idea how to make Blondy angry enough to do something about his condition. He makes up a story about dating Sally and tells Blondy, "If you wasn't such a dirty quitter, you'd be takin' her out yourself." This ruse goes on for weeks with Swede getting all dressed up and going out several evenings each week on a "date." Of course, he's not seeing Sally, but Blondy doesn't know that. In the end, the ruse has its desired effect, and Swede's "tough love" turns out to be just what the doctor ordered. One problem, unfortunately, is that there appears to be about five minutes or more of the original film missing. It runs 65 minutes, but the original length was over 7,000 feet, or a good 70 minutes. The place in the film where this is most noticeable is after Red falls to his death. The scene immediately following that shows the men on their knees at the crap game, heads bowed solemnly. In another scene, Swede is outside the building where he and Blondy live. He stands over a man lying on the sidewalk and says, "I'll learn you to crack wise with perfect strangers which they got their health!" A second shot shows the man lying on the sidewalk rubbing his chin, but we didn't see how he got there. Yes, it's obvious Swede punched him, but what did the man do to deserve the punch? But a few missing minutes doesn't significantly affect the enjoyment of the movie. We still have the excellent art direction, a solid story, well-developed characters and a very effective mixture of comedy within the drama. In spite of all this, "Skyscraper" somehow didn't survive the years as one of the most memorable films of the silent era. Maybe the story is a little too simple. It's possible they should have leaned a little more on the drama and a little less on the comedy. Maybe the role of Sally was underdeveloped and wasn't allowed its fullest potential. Since the direction is only average, maybe the same story could have succeeded better under a more capable director. Who knows? As mentioned, the film has the look and feel of a more ambitious project than the end result shows. There is a full-page ad in the Screenland issue of May, 1928 for the movie. This is at least some indication they were promoting the film as a better than average product. But, forget about why it's not on somebody's top 50 list or featured in some book of "greatest silent films." It's good entertainment, funny, moving, and a very worthwhile way to spend 65 minutes.